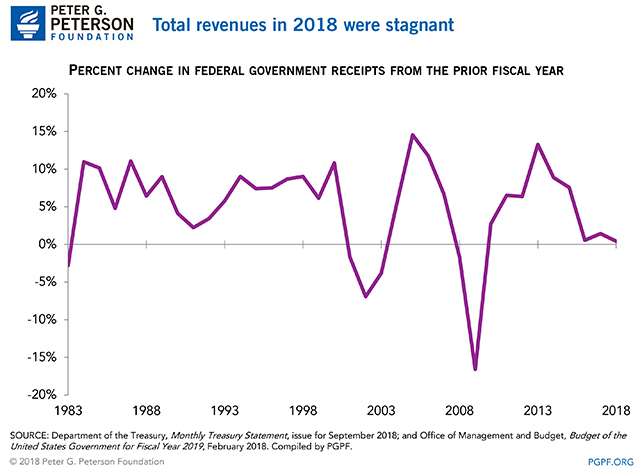 Total revenues received by the federal government in fiscal year 2018 grew by just 0.4 percent compared to fiscal year 2017, according to the Department of the Treasury. That is a considerably lower rate of growth than would be expected given the healthy economic situation that currently exists. What can we learn from this data, and what does it mean for our fiscal outlook? It’s rare for revenue growth to be as weak as it was in 2018. Revenue growth below 0.4 percent had only occurred in 15 years from 1945 through 2017. The last 5 months of the fiscal year demonstrate how the recent tax legislation is actually reducing revenues. In the past 35 years, there have only been three periods during which total revenue growth was lower than it was during 2018. First, in fiscal year 1983, revenue dropped by 2.8 percent due to the Economic Recovery Tax Act of 1981 and the effects of a recession that ended in November 1982. 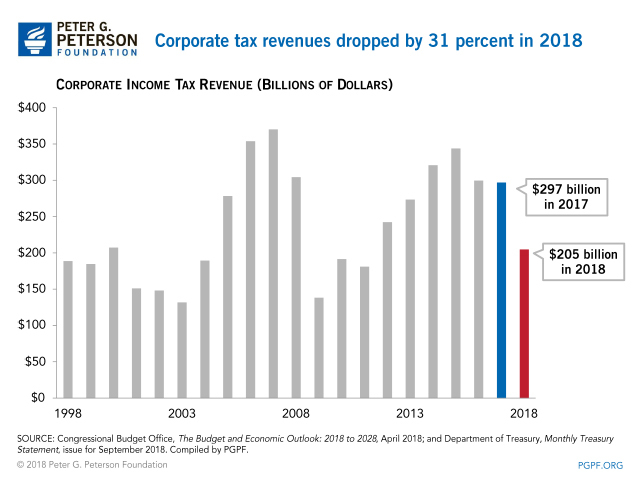 From 2001 to 2003, yearly revenues dropped because of a series of tax cuts, the most significant of which was the Economic Growth and Tax Relief Reconciliation Act of 2001. Revenues during that period were also affected by a recession that ended in November 2001. Revenue decreases during 2008 and 2009 were a result of the Great Recession and the legislation enacted in response to it. The minimal growth in revenues during 2018 has a key distinction from the above periods: there was no recession. This indicates that the slow growth in revenues was brought on solely by legislation, not economic factors. While the 0.4 percent growth rate indicates a small year-over-year increase in revenues, this result is much lower than might be expected given the economic environment. For example, revenues did not keep pace with inflation, which was 2.3 percent during FY18, nor nominal GDP growth, which CBO projected to be 4.9 percent during FY18. 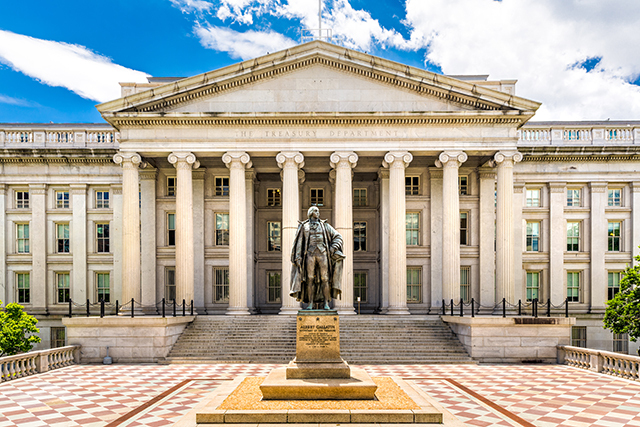 Examination of Treasury data for fiscal year 2018 reveals that full implementation of the TCJA led to a reduction in revenues relative to the previous year. 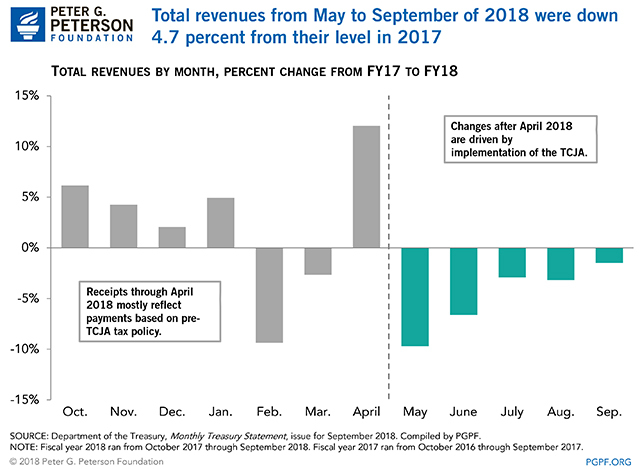 In large part, receipts through the first seven months of fiscal year 2018 reflected payments based on pre-TCJA tax policy, while changes after April 2018 were driven by full implementation of the bill — and the result is lower tax revenues for that latter time period. Total revenues from May to September of 2018 were down 4.7 percent from the amount recorded in the same period of 2017. The main driver of the stagnation of total revenues in 2018 was corporate income tax receipts. They fell by 31 percent in 2018; such a large drop is unprecedented during a time of economic growth. The decline in corporate tax payments resulted from provisions of the Tax Cuts and Jobs Act (TCJA), which lowered the statutory tax rate and expanded the ability to immediately deduct the full value of equipment purchases. The decrease in revenues from corporate taxes was offset by an increase in individual income tax receipts, which grew by 6 percent during fiscal year 2018. However, the primary driver of that growth was final tax payments for calendar year 2017, which were made in April 2018. 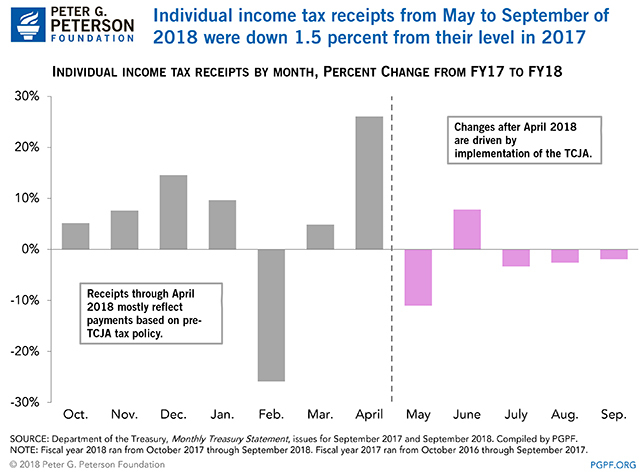 For the period from May to September (during which changes were driven by implementation of the TCJA), individual income tax receipts dropped by 1.5 percent compared to the same period in 2017. That decline reflects lower withholding as a result of the reduction in individual tax rates enacted as part of the TCJA. The tiny increase in revenues in 2018 during a period of strong economic growth highlights the detrimental effect that the TCJA has had thus far on our fiscal situation. Revenue collections in last five months are a worrying indication that future revenue collection will be constrained, which will contribute to increases in the deficit.